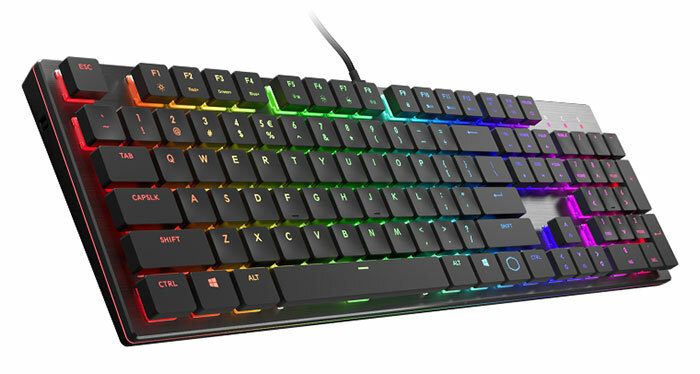 Cooler Master has released a pair of low profile mechanical keyboards. The new SK650 and SK630 now form the foundation of the chiclet keycap featuring Cooler Master SK series. Thanks to the use of the new Cherry MX low profile keyswitches, Cooler Master asserts that PC enthusiasts can now own a "slim, full-sized mechanical keyboard that’s stripped down only in appearance, not quality". On-the-Fly Controls - Make real-time adjustments to lighting and macros with no software necessary, including Windows Lock On/Off to prevent getting kicked out of the game when the Windows Key is accidently pressed. Easy-to-use Software - Map 16.7 million colours to any key, customize lighting modes, or fine-tune macros through Cooler Master’s Portal Software Application. Moving on to consider the tech specs, these keyboards come with a removable 1.8m braided USB Type-C Cable for easy transportation and future-proofing. Users can benefit from Hybrid Key Rollover with automatic switching between 6KRO and NKRO to ensure legacy compatibility. The polling rate is 1000Hz, with a response time of 1ms. Both keyboards come equipped with a 32-bit ARM Cortex M3 processor for consistent precision and performance. As portability is mentioned in the launch publicity for these keyboards, it is worth mentioning that the full sized SK650 measures 430 x 125 x 25 mm and weighs 629g, while the tenkeyless SK630 measures 353.5 (L) x 125.5 (W) x 29.8 (H) mm and weighs 552g. I like to have a keyboard with some mass to it, but also appreciate light weight and compact hardware for taking on trips, so would be interested to check out the new SK series in the flesh. Cooler Master provided links to pre-order pages for the SK650 and SK630 at OC UK. They are both currently on pre-order, at £159 and £119 respectively. Later in the year, Cooler Master will be adding an even smaller SK keyboard to its range. A teaser for the Bluetooth compatible SK621 - 60 per cent keyboard is shown on both official product pages. Wireless versions of the SK650 and SK630 (TKL) are also on the way and will be dubbed the SK651 and 631. Last but not least, Cooler Master will be introducing white versions of these keyboards in the not-too-distant-future.